It’s art! It’s cereal! It’s both! If you remember the soothing voice of Bob Ross, then just add milk to this add listen to him talk as you eat. Okay, that’s not going to happen. But you can still enjoy some cereal inspired by the guy that inspired many artists. I know that some people think he was not that great and basically painted the same type of thing over and over, and I think those people are missing the point. The point was in the joy of painting, which Bob Ross often talked about. He also shared the basics of technique, brush types and how and why to use them. 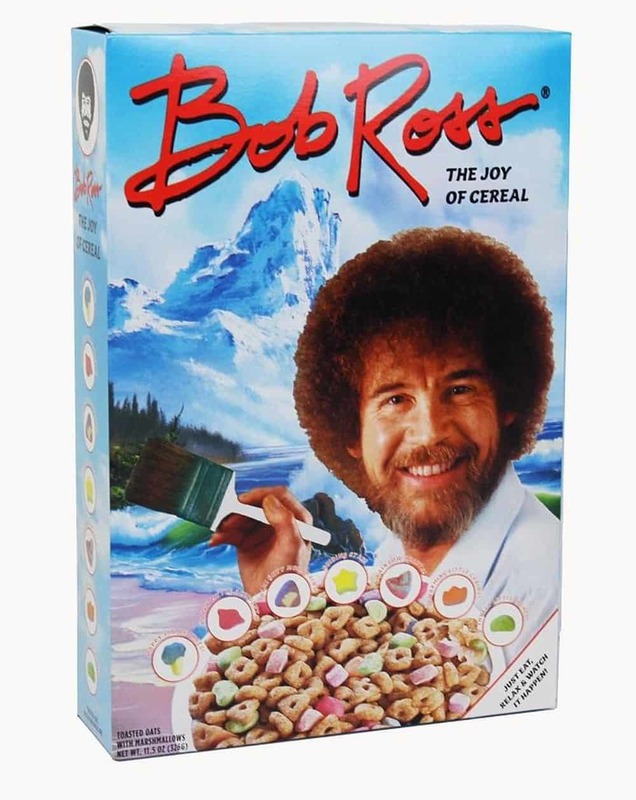 And the fact that you can still get Bob Ross branded art supplies, books, instructional videos and yes, Chia pets and cereal, only speaks to the creativity and appeal of this artist. Besides, it’s a happy looking little cereal, and it looks good in the bowl.